Below is an excerpt from Julia’s Jeffrey Pine Journal article. Pick up a copy of our Spring JPJ this April for more stories from the Racetrack Project. My first sight of Death Valley’s Racetrack Playa was like a glimpse of another planet. The ancient lakebed was the color of tahini, spread out smooth and flat between jagged desert peaks. At one end, the startling black rock pillars known as the Grandstand caught the eye like a pin on a map. 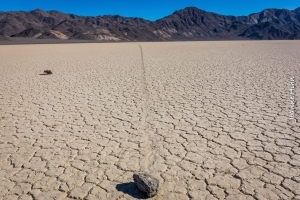 At the other, the famous “racing rocks” lay scattered, each sitting in the furrow it had etched as a mysterious coincidence of ice and wind pushed it across the playa. Despite its name, the Racetrack is officially closed to vehicles to preserve its otherworldly scenery and opportunities for quiet recreation. In muddy conditions, people are encouraged to keep off the playa too, since tracks made in the mud create deep impressions that harden as the sediment dries out and can remain clearly visible for months. Yet either through ignorance or willful disrespect, trespasses occur. Death Valley National Park staff estimate that the playa is scarred by several miles of vehicle tracks made by trucks, ATVs, motorcycles, and even, recently, a small airplane. 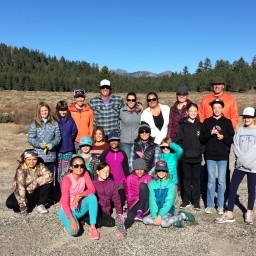 During Presidents’ Day Weekend this February, volunteers from Friends of the Inyo and the Eastern Sierra 4 Wheel Drive Club joined park staff in the first ever large-scale effacement project, piloting an ingenious new method to wipe away the marks of trespass on the playa. The first step in the process was to elevate the compressed sediment within the tracks so it was flush with the undisturbed surface of the playa. We accomplished this using rakes and cultivating tools called garden weasels. It was difficult to break through the sturdy crust, but the softer mud beneath crumbled readily. Soon, the tracks were transformed from compacted troughs to a level surface of pulverized sediment. The next step was to smooth out lumps or irregularities with concrete floats—large, flat panels attached to long handles, like massive irons pressing out any remaining wrinkles. Finally, we saturated the working area with a fine mist of water, mimicking the seasonal storms that flood and reform the playa’s crust. Within moments, we could see the characteristic polygonal cracks appearing like magic in the wet mud. 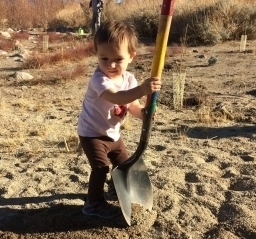 Friends of the Inyo is building a partnership with Death Valley to provide volunteer and professional labor for future effacement projects. As a starting point, we expect to work with the park for up to four weeks in the fall of 2018. 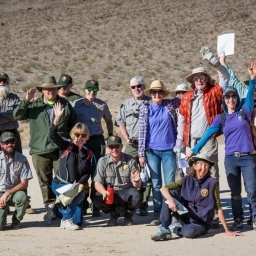 Many thanks to the volunteers who donated their time to the Racetrack Project, and to Death Valley National Park for coordinating our efforts. Stay tuned for information about how you can be involved in the next effacement project! 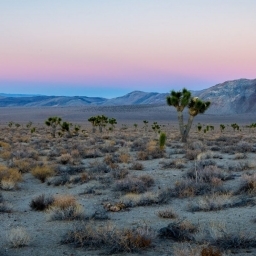 The Desert Renewable Energy Conservation Plan is Under Attack!